"CONISAN A® - Proven 67% successful in the treatment of cataracts and other degenerative eye disorders." 1. Fuchs J, "Conservative treatment of senile cataract with Conisan A®." Klin. Mbl. Augenheilk, 175 (1979), 799-805. 2. Seifert J, Ganser R, Pfleiderer A, Brendel W, "Absorption and distribution of cytoplasmic organ lysates (Conisan A® eye-drops), following intraconjunctival application." Klin. Mbl. Augenheilk, 175 (1979), 795-798. 3. Fuchs J, "The effect of Conisan A ® eye-drops on cataracts." Med. Monatsschrift, May 1975, Page 224-225. 4. Fuchs J, "Is it possible to influence a senile cataract with drugs?" Med. Klinik 78, (1983), 171-174. DISCLAIMER: All information is educational and provided under Bionational terms & conditions and does not, and should not replace the advice of your physician. "12 Year German Study on 356 eyes with cataracts achieves 67% success in the treatment of cataracts and other degenerative eye disorders..."
In addition to the success in the treatment of cataracts Conisan A® prevents deterioration and prolongs normal vision in older individuals. 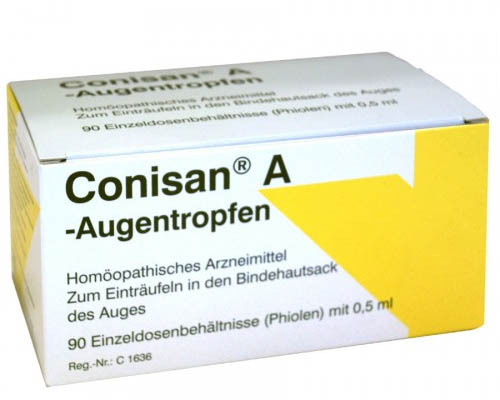 Conisan A ® has been widely used in Europe for over 12 years and has been tolerated extremely well, even in prolonged usage there are no known side effects. * Treats eye strain etc. NOTE: Regular users report having to get weaker prescription lenses, a clear indication of eye site improvement. With over fifteen years of use in Europe Conisan is completely safe and suitable for prolonged use. "Break a vial and instill a couple of drops into each eye several times daily. Product should be stored in the fridge when not in use.."
Dosage and Application: Break off the upper part of the vial by twisting it. If no other dose regimen is recommended by the attending doctor, instill several times daily 1-2 drops in the conjunctival sac of the eye and possibly also inhale through the nose by applying slight pressure to the body of the vial. Each box contains 20 x 0.5 ml vials. At the recommended dosage of 1-2 drops several times daily one box will last one month for one eye or 2 weeks if treating both eyes. Intolerance and Risks: None, when used as prescribed. Separate one vial of Conisan A ® with the unit dose from the strip. Twist the printed tag from the body of the vial. Gently tap to bring the liquid into the narrow part of the vial. Hold vial approximately in the middle, between thumb and index finger, squeeze gently with the tip of the finger. Ensure pressure compensation after each drop. Order this amazing product now.